My inspiration piece was a tall silver lantern I received as a gift from my beloved niece Vanessa last Christmas. The lantern, although shiny had a wooden handle and I felt this evoked a rustic ambiance. I let natural elements set the course for this arrangement and reflected the silver tones of the lantern in mini silver ornaments wired onto florist stems, saved from a florist arrangement last year. 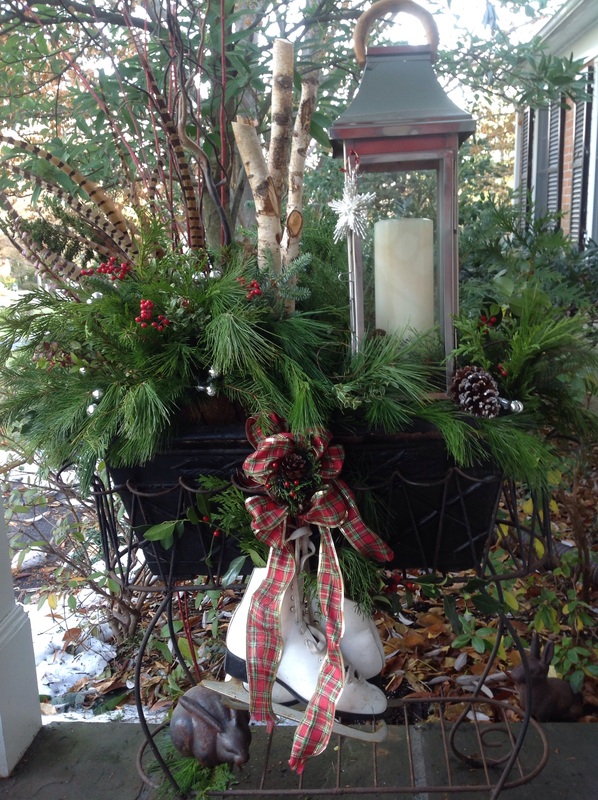 Using winter motifs such as skates and a snowflake ornament will extend the season of the planter beyond Christmas. The silver blades of the skates complemented the lantern’s silvery shine. The white leather and the white in the birch logs and snowflake all balanced the white of the tall pillar candle. The skates filled with their own greens and tied onto the front of the planter with a big plaid French ribbon and bow provide a touch of whimsy. 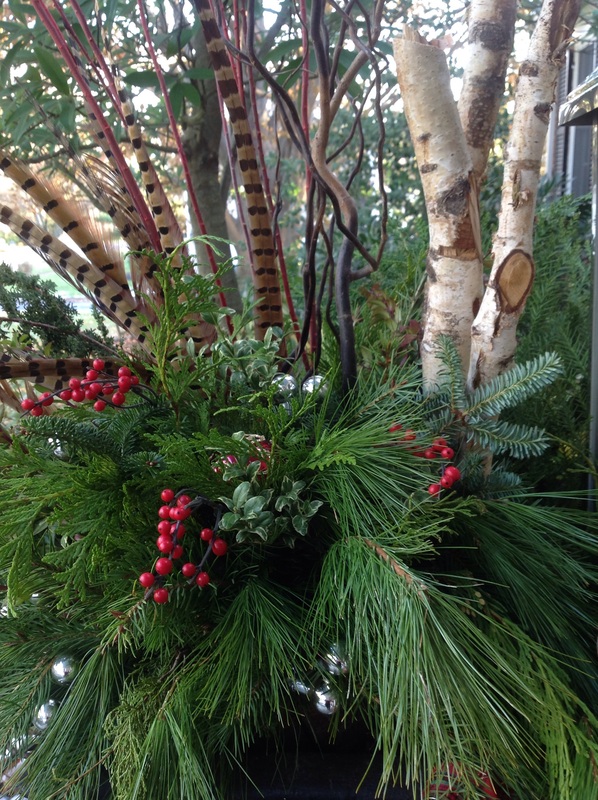 The nature inspired planter has plenty of sparkle and shine to extend a festive wintry welcome! The principals of creating a planter of winter greens is much the same as that of working with annuals in your summer planters: think height, trailers and fillers in between. The more textural interest you put in the planter, the more beautiful it will be. 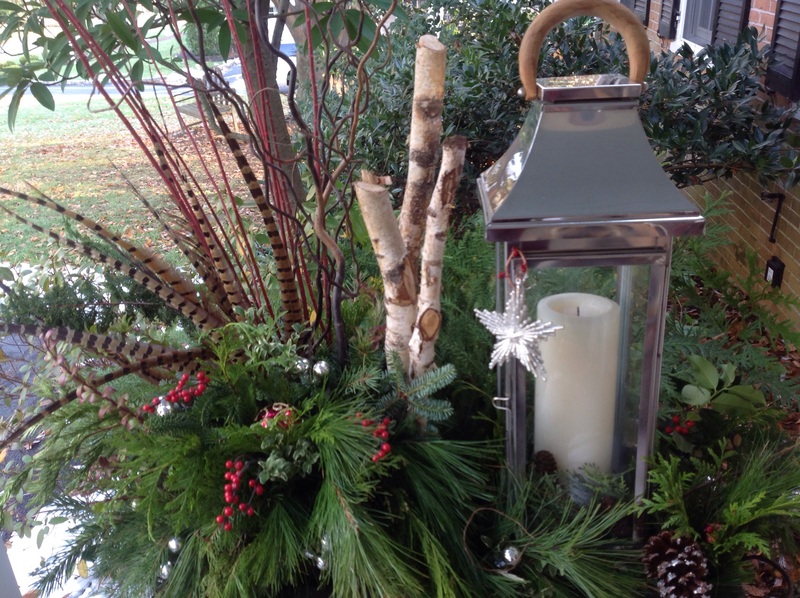 This large planter was created in 2 parts: the lantern and everything else. The lantern’s height determined the placement of all the other foliage. I rested the lantern on some cardboard on the soil to keep it secure. I then arranged a basket of greens to its left, which I plopped inside the planter. The soil was moist when I started to work. By working in a basket I could spin it around as I created it and look at my arrangement from all sides as I worked. Angulate the greens you want to “spill” outwards by inserting them on a downward pointing angle. 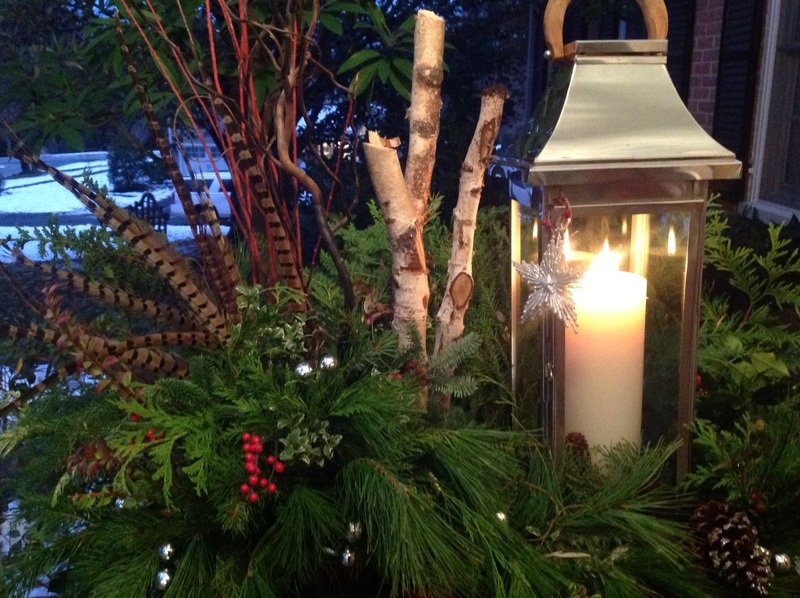 In between the lantern and the greens I placed the birch logs, curly willow and red twigs. The final touches were the feathers, pine cones, berries and the ornaments. I tucked several branches of extra greenery around the while planter until I was satisfied with its fullness. It is important to step back from your container planter to critically assess it as you work and make the necessary adjustments. My planter is at eye level and will be seen from above. I bore this in mind when creating it. All the greens were sprayed with Wilt Proof, a moisture preservative designed for evergreens. Work outside with this spray, it is nasty. 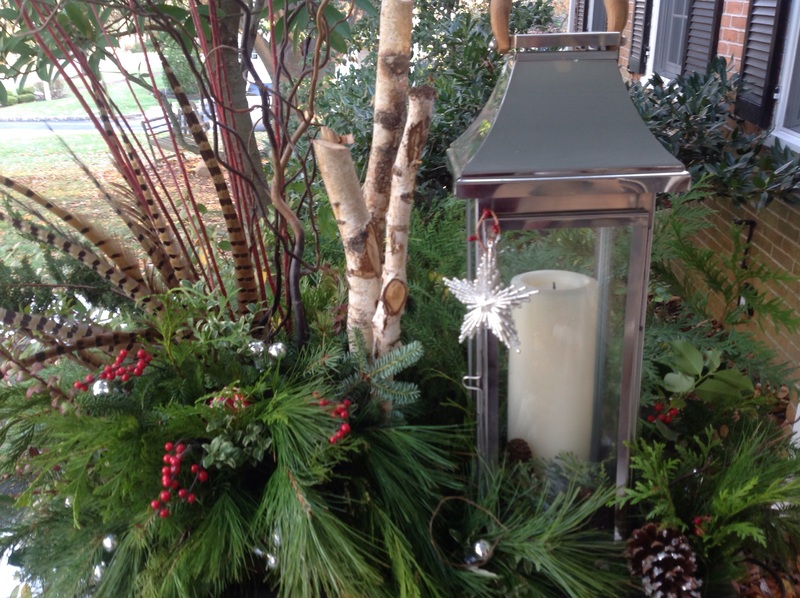 For garden enthusiasts I am listing the evergreens used in creating the arrangement. Any varieties are fine bearing in mind you need some that are sturdier for the center and for height such as fir or spruce and others that are softer for delicate spilling effect such as cedar and white pine. Other considerations include selecting greens that are varigated and of different hues/colors and of different textures. I chose some cryptomeria with tiny pinecones attached to its boughs. Lovely detail! My greens included: white pine, frasier fir, douglas fir, varigated origonia, boxwood, red huckleberry, gold tip cedar, incense cedar, golden arbovitae, arbovitae, Leyland cypress, fern leaf cypress, yew, holly, Japanese cryptomeria and spruce. I used all things I had on hand for this project, repurposing ornaments in new roles. The birch logs were serendipitously trash picked on a roadside yesterday! After Christmas, you could remove the ornaments and have the planter transition into a winter planter. I hope to have inspired your holiday décor. 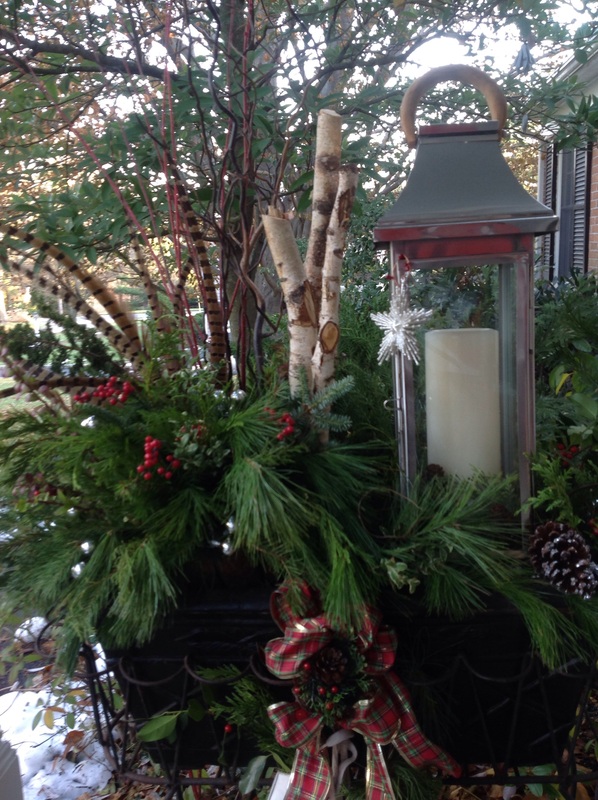 This entry was posted in Gardening, Home Décor and tagged ,birch logs in outdoor container, Birch log Christmas container, birch logs and evergreen container, Christmas container, evergreen planter, front entrance winter paknter, outdoor Christmas planter, outdoor winter planter, seasonal Christmas into winter planter, Winter container by Johanne Lamarche. Bookmark the permalink. I will begin my decorating a little later today! And even found the birch roadside! How likely was that?! Enjoy your decorating Nancy and thank you for reading. Hope you had a lovely Thanksgiving! Oh, good heavens! This is so lush and beautiful!!! I never do anything outdoors like this, but I think I’ll start now! What a beautiful sight to behold!!!! I’d be the envy of everyone on the cul-de-sac with a couple of these on the front porch. My only concern with these stout Missouri winds is that they’d blow away. I guess I’d have to anchor the containers with a lot of wet sand of something. I also need to check my wholesale source for some of that Wilt Proof. I don’t remember seeing it on the shelves, but surely they’d have it….one would think! I had never heard of Wilt Proof but my garden club did a workshop at a nursery and they recommended it and sold it of course! I placed the lantern which is already quite heavy 4 inches below the surface. Then I filled the base with river rock to weigh it down. So far so good. Usually I have this planter against the house but moved it this year and it is more exposed. We did have high winds this week and it did not budge! Thank you for visiting and your thoughtful comments Alycia! How did you get your lantern to stay put? I dug some of the dirt out of the container so the lantern sits about 4 inches below the rim of the container. We had high winds Monday and I got nervous it might topple over eventhough it is a heavy lantern. So I removed the candle and filled the base with river rocks to weigh it down. I then replaced the greens and candle and it’s been very sturdy. If such a planter was placed against a wall, that would be even better. Thanks for visiting! 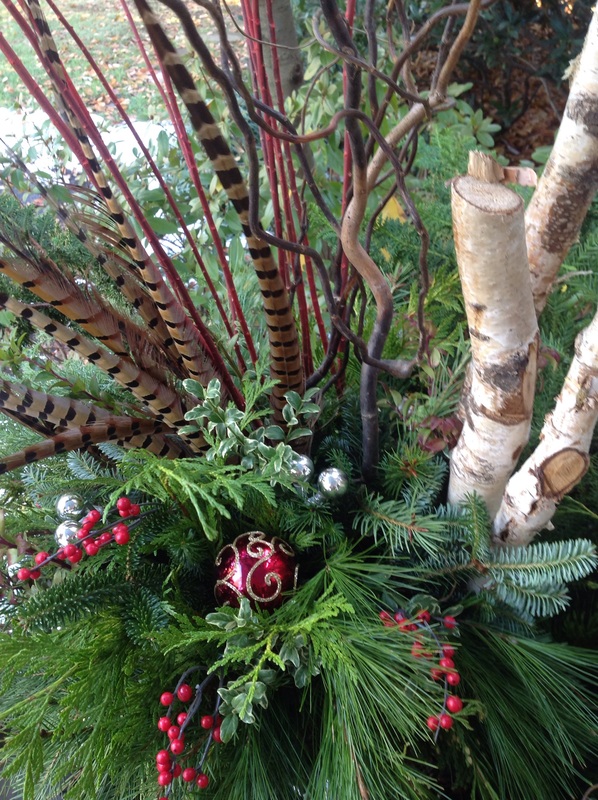 This arrangement is so gorgeous Johanne, I am really jealous of your talent! All I have to do is a look at a plant and it dies haha! I can just imagine how festive and beautiful this looks outside your house, and I love how you can just make a few minor changes to change from festive to all round winter! Thank you for hosting this week Michelle! Have a wonderful weekend. Absolutely stunning Johanne! Honestly, leave it to you to turn trash into treasure and make a show stopper of a statement. I love how you have tied in the colours – the smooth white of the leather and the texture of the birch are also superb. Wonderful! Thank you Selma! I enjoyed making this arrangement. It is a very merry welcome at our front doir! Congratulations on being featured this week! Well deserved. I love the rich variety of greens you have chosen – I will try and increase my choices this year – it makes such a difference. It does especially for a container that is at eye level. 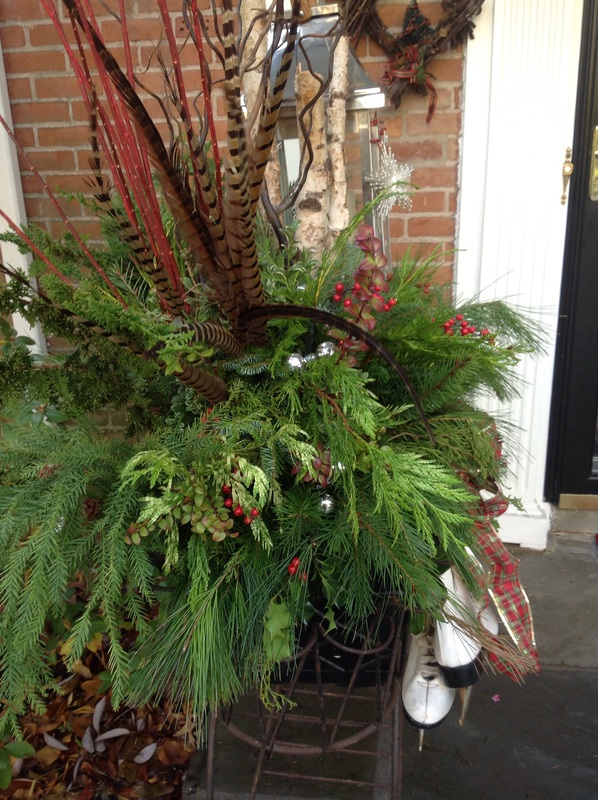 This planter really rewards admirers with its interesting variety of greens. I discovered so many more when taking a class at a nurseery recently in arranging greens. Thanks for stopping by Ginger! Thank you Judi! i’m all about nature. Love the fresh scent.